Scenario: called to A&E to assess a 20 year old man who hurt his foot after jumping off a wall. No other injuries. 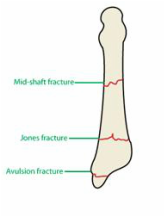 Attempt to discern fracture versus soft tissue injury. Dorsal-plantar, lateral, and oblique views. Cast or rigid-bottom orthopaedic shoe, may use elastic support bandages. 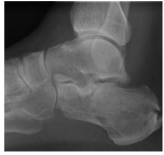 Causes displacement of 2nd/3rd/4th Metatarsals from the 1st metatarsal. Often subtle and easily missed. Large degree of swelling observed. Most missed foot fracture. Need weight-bearing views. Look for widening between bases of the first and second metatarsals or between the middle and medial cuneiforms. Second metatarsal base fracture is suspicious for this injury. Non-displaced – immobilization in backslab and non-weightbearing. Review in fracture clinic 1 week. Displaced – risk of AVN, apply backslab, further investigation with CT, discuss with senior. Investigate with CT scan to determine displacement and articular invovlement. Intra-articular – reduced Böehler’s angle – discuss with senior - possibly for operative fixation. Extra-articular minimally displaced – Immobilization, non-weightbearing. Review fracture clinic 1 week. Extra-articular displaced - may require fixation - discuss with senior.